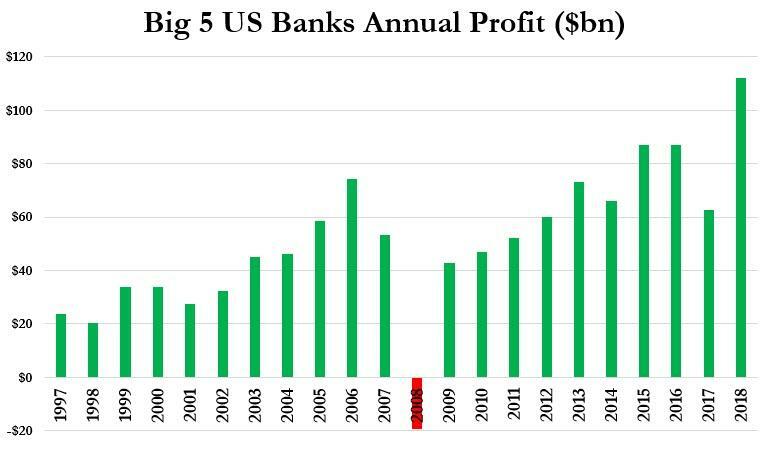 One may not know it by looking at banker bonuses last year, but 2018 was a banner year if only for bank shareholders and upper management: this is the year when the 6 biggest banks generated (well) over $100 billion in profit. They can thank Trump’s tax cuts, the Fed’s payment of interest on reserves, rising interest rates, a jump in dealmaking and a retail-banking boom (if not so much the “bad volatility” that resulted in a plunge in fixed income, currency and commodity trading fees). 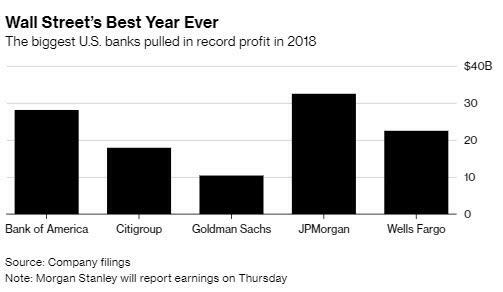 Her optimism may have been a bit stretched as this quarter JPM missed earnings estimates for the first time in 15 quarters, while the bank’s provision for loan losses surged to $1.55 billion, far above the expected $1.3 billion. Meanwhile, the question is whether or not the market already reflects the banks’ massive profits, or if there is room for bank stocks to run more: the KBW Bank Index surged 10% this month, on the back of a furious bear market rally and following generally strong fourth-quarter results; however, it comes after banks slumped into a bear market, plunging 20% in 2018, the worst performance in seven years.